You’ve probably seen the destruction wrought by e arthquakes on the television news. Californians know about this first-hand, and several other areas in North America have also experienced strong earthquakes. Earthquakes range from faint tremors to wild motions that shake buildings apart. Most earthquakes are produced by sudden slip movements along faults. These happen because rock on both sides of the fault is slowly bent over many years by tectonic forces. Energy builds up in the bent rock, just as it does in a bent archer’s bow. When that pent-up energy reaches a critical point, the fault slips and relieves the strain. Rocks on opposite sides of the fault move in different directions, instantaneously releasing a large quantity of energy in the form of seismic waves. These waves radiate outward, traveling through the Earth’s surface layer and shaking the ground. (The term seismic means “pertaining to earthquakes.”) Like ripples produced when a pebble is thrown into a quiet pond, these waves gradually lose energy as they travel outward in all directions. In 1935, seismologist Charles F. Richter devised the scale of earthquake magnitudes that bears his name. Figure 12.27 shows how the Richter scale relates to the energy released by earthquakes. In 1977, Hiroo Kanamori devised a more accurate way to calculate this energy and revised the rating of a number of large earthquakes. 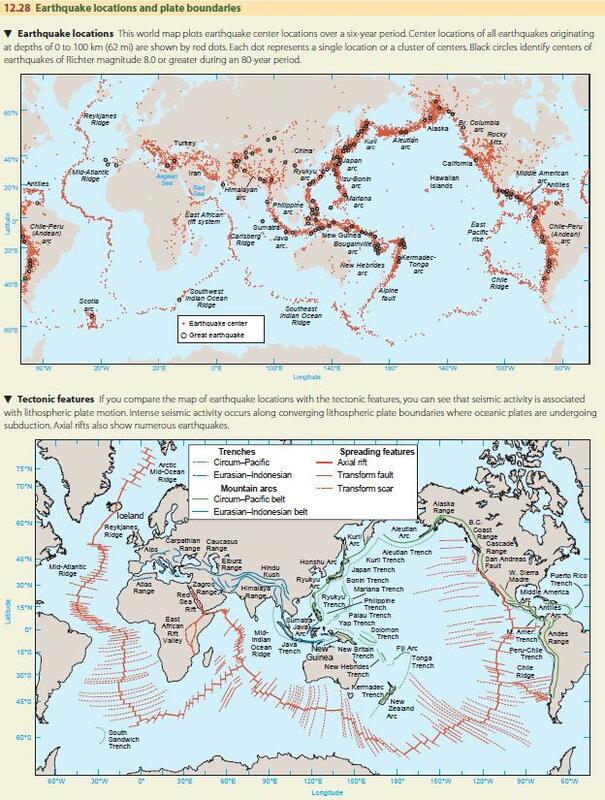 Figure 12.28 compares a map showing the centers of large earthquakes observed during a six-year period with a map of tectonic features. 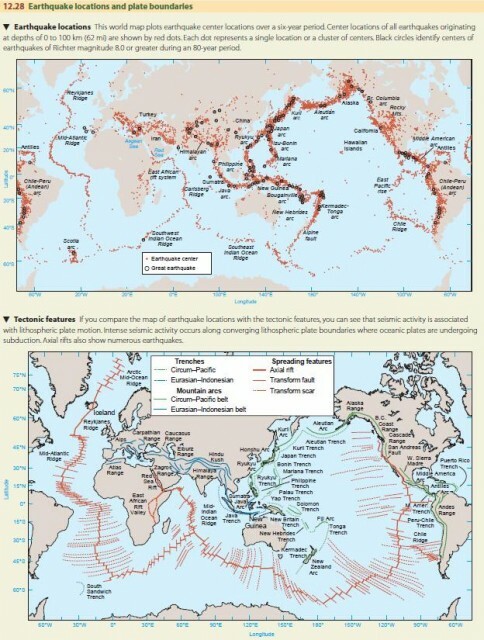 The pattern of earthquakes follows subduction boundaries, transform boundaries, island arcs, mountain arcs, and axial rifts, showing the relationship between earthquakes and tectonic activity. The recent earthquake in L’Aquila, Abruzzo, Italy, magnitude 6.3, occurred along the central Apennine mountain chain, running down the center of the peninsular nation. These mountains are part of a complex collision between the African plate and Eurasian plate. Close to 300 people died and over 1000 were injured, mostly in collapsed buildings. A few earthquake centers are scattered over the continental plates, far from active plate boundaries. We aren’t certain why these occur. In many cases, no active fault is visible. For example, the great New Madrid earthquake of 1811 was centered in the Mississippi River floodplain in Missouri. 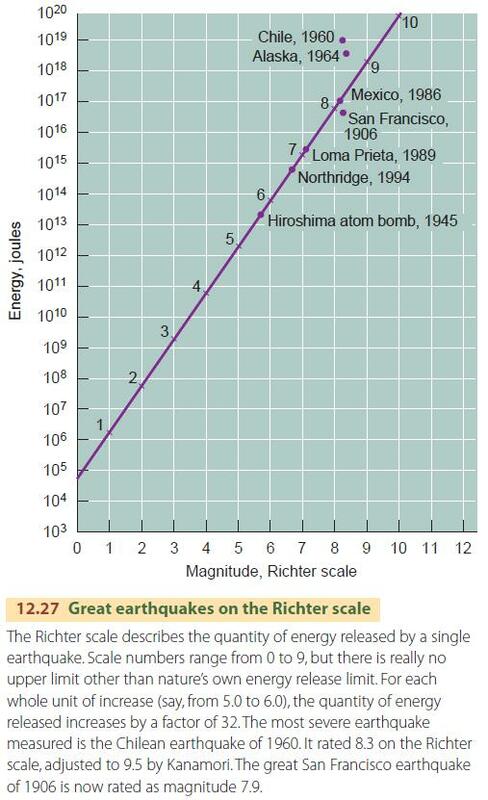 It produced three great shocks in close succession, rated from 8.1 to 8.3 on the Richter scale. The earth movements caused the Mississippi River to change its course and even run backwards in a few stretches for a short time. Over a hundred years have passed since the great San Francisco earthquake of 1906. That disaster was generated by movement on the San Andreas fault. Since then, this sector of the fault has been locked—that is, rocks on the two sides of the fault have been held together without sudden slippage. In the meantime, the two lithospheric plates that meet along the fault have been moving steadily with respect to each other. This means that a huge amount of unrelieved strain energy has already accumulated in the crustal rock on either side of the fault. On October 17, 1989, the San Francisco Bay area was severely jolted by an earthquake with a Richter magnitude of 7.1. The earthquake’s epicenter was located near Loma Prieta peak, about 80 km (50 mi) southeast of San Francisco, at a point only 12 km (7 mi) from the city of Santa Cruz, on Monterey Bay. The city of Santa Cruz suffered severe structural damage to older buildings. In the distant San Francisco Bay area, destructive ground shaking proved surprisingly severe. Buildings, bridges, and viaducts on landfills were particularly hard hit. Altogether, 62 lives were lost in this earthquake, and the damage was estimated to be about $6 billion. In comparison, the 1906 earthquake took a toll of 700 lives and caused property damage equivalent to about 30 billion present-day dollars. Geologists state that the Loma Prieta slippage, though near the San Andreas fault, probably has not relieved more than a small portion of the strain on the fault. We can’t predict when there’ll be another major earthquake in the San Francisco region—but it is inevitable that there will be one. As each decade passes, the probability of that event becomes greater. Along the Southern California portion of the San Andreas fault, a recent estimate placed the likelihood that a very large earthquake will occur within the next 30 years at about 50 percent. In 1992, three severe earthquakes occurred in close succession along active local faults a short distance north of the San Andreas fault in the southern Mojave Desert. They led seismologists to speculate that a major slip on the nearby San Andreas fault is even more likely to occur in the near future. For residents of the Los Angeles area, an additional serious threat lies in the large number of active faults nearby. Movements on these local faults have produced more than 40 damaging earthquakes since 1800, including the Long Beach earthquakes of the 1930s and the San Fernando earthquake of 1971. The San Fernando earthquake measured 6.6 on the Richter scale and severely damaged structures near the earthquake center. In 1987 an earthquake of magnitude 6.1 struck the vicinity of Pasadena and Whittier, located within about 20 km (12 mi) of downtown Los Angeles. The Northridge earthquake of 1994, at 6.7 on the Richter scale, produced the strongest ground motions ever recorded in an urban setting in North America and the greatest financial losses from an earthquake in the United States since the San Francisco earthquake of 1906. Sections of three freeways were closed, including the busiest highway in the country, I-5. A slip along the San Andreas fault, some 50 km (31 mi) to the north of the densely populated region of Los Angeles, will release an enormously larger quantity of energy than these local earthquakes. Although the city is some distance from the fault, it would be severely affected. The intensity of ground shaking might not be much different than the San Fernando earthquake, for example, but it will last much longer and cover a much wider area of the Los Angeles region. The potential for damage and loss of life is enormous. As we’ve seen, tsunamis, or seismic sea waves, can be caused by major earthquakes, usually centered on a subduction plate boundary. The sudden movement of the seafloor near the earthquake source generates the tsunami wave train. Tsunamis are sometimes called “tidal waves,” but since they have nothing to do with tides, the name is quite misleading. The 2004 Indian Ocean tsunami, described in this chapter’s opening section, is an example of the devastation that a tsunami can be cause. Volcanic explosions can also produce strong tsunamis. Krakatoa, a volcanic island in Indonesia, violently erupted in 1883, generating tsunamis that killed more than 36,000 people living in low coastal areas of Sumatra and Java. Underwater slumps of rock and sediment on continental slops and at volcano margins can also generate large tsunamis.